So you got a telescope for Christmas ... what next? This post was inspired by an email from a reader. Having received a spanking new telescope for Christmas, and having successfully assembled it, despite the instructions looking like they were photocopied onto recycled rice paper using a 1980's photocopier. So there it is, bright, shiny, bursting with potential. What planet or star should you look at first? The Moon. The Moon is big, bright easy to find, and has lots of interesting features. It is perfect for getting familiar with the intricacies of your new scope, and circumventing the problems that can cause people to hurl the scope into a garage and leave it to gather dust for the next century. Actually, first off, take it out in the afternoon and set it up in the light where you can see all the bolts and cables, so you can see what you are doing. make sure you are somewhere where you can't accidentally see the Sun through your scope. Nothing ruins a Christmas present more than if it sends you blind. Make sure you tighten up all the bolts especially those in the tripod mounting. A lot of frustration occurs when the telescope wobbles so much you can't focus or any time you look through the scope the objects jiggle to much see anything. Also make sure the knobs that hold the finderscope to the telescope tube are tight, if the finderscope moves around it can cause no end of grief. Then put the lowest power eyepiece in the scopes tube. Now to tackle the thing that engenders the most frustration of all, aligning the finderscope with the telescope. Point the telescope more or less in the direction of something distant, like a telegraph pole. Look through the finder scope and adjust the alt-azimuth movement knobs until the telegraph pole is centered in the cross hairs, then look though the eyepiece (low power, remember). If you are lucky, then at least a bit of the telegraph pole is visible through the eyepiece, if so use the movement knobs to centre the telegraph pole in the eyepiece. Then use the adjustment knobs of the finderscope to get the telegraph pole in the centre of the finderscope again. This way, the next time you point the finderscope at something, it should be more or less centered in the low power eyepiece (make sure you don't bang the finderscope out of alignment now, or there will be a lot of weeping and wailing and gnashing of teeth). Now wait for twilight to fall and the Moon to rise. The Moon is waxing at the moment, and there are lots of nice craters and so on to see. Keep the low power eyepiece in. I know everyone one wants to go high first off, but trust me. Point the telescope in the direction of the Moon. Look through the finder scope and adjust the alt-azimuth movement knobs until the Moon is centered in the cross hairs (just like you did with the telegrapgh pole), then look though the eyepiece. If you are lucky, then the fiddling with the telegraph pole you did earlier will result in at least a bit of the Moon is visible through the eyepiece (it won't be exact because the telegraph pole is much closer then the Moon, and the parallax will be different), if so use the movement knobs to centre the Moon in the eyepiece. Then use the adjustment knobs of the finderscope to get the moon in the centre of the finderscope again. Now, when you next go out astronomical objects will be more or less centered in the low power eyepiece. general direction of the Moon until you can see Moonlight coming down the tube. Once that's happened, put the low power eyepiece back in and use to movement knobs to centre the Moon. Then go back to the finderscope and centre the Moon in that (you may have to juggle back and forth between the eyepiece and the scope if the alignment is really out). Once the low power eye piece is set up, enjoy the lowpower view of the moon and practice using the movement knobs and the focus knobs. Getting used to setting up the focus can take some time. Then put in the higher power eyepiece, note where the Moon is (it will probably be out of focus in the high power lens, you will have to adjust it). Play around with the low and high power views getting used to using the focus knobs and the movement knobs and the finderscope. In the high power eyepieces, you will also note that the Moon will slowly (or rapidly depending on how powerful it is) move out of the field, so you need to constantly adjust the movement knobs. Once you have had a good play with the Moon, it is time to go planet hunting. Unfortunately, the only planet visible in the evening at the moment is Jupiter (unless you really feel like getting up at 4 am to see Mars and Saturn), and its is low on the horizon. 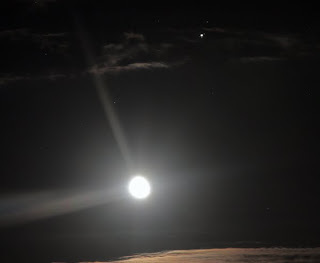 By the time you have finished playing with the Moon, Jupiter may have set. Don't despair, next night, go out and play with the Moon again (just to refresh yourself and check that the finderscope has not been knocked out of alignment). Now look west. The obvious bright object above the western horizon is Jupiter, get it into the finderscope, first with the low power lens to make sure it is in view, and enjoy. Southern SkywatchJanuary 2010 edition is now up! 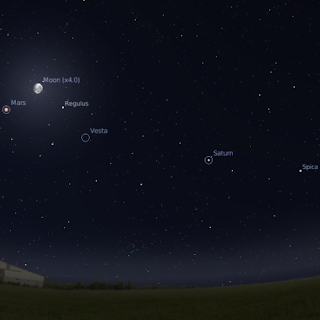 The evening sky facing west in Melbourne on January 18 at 9:00 pm AEDST (8:00 am AEST) showing the Moon and Jupiter. (similar views will be seen from other cities at the equivalent local time eg 8:00 pm ACDST Adelaide. The January edition of Southern Skywatch is now up. There's the opposition of Mars, Saturn close to the Moon, a partial Lunar Eclipse (WA only), an occultation of the Pleiades and a Blue Moon. The Full Moon is Friday January 1. Jupiter is easily seen as the brightest object in the western evening sky. 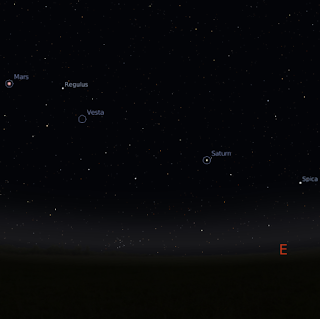 In the morning, Mars and Saturn are easily seen above the north-eastern horizon near the bight stars Regulus and Spica. These planets are visited by the Waning moon this week. Partial Lunar eclipse morning January 1 (WA only). 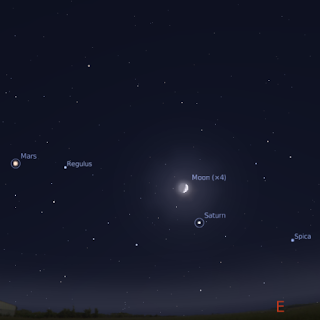 Morning sky looking north-east showing the Moon, Mars, Saturn, Regulus and Spica at 3:00 am local daylight saving time (2:00 am non-daylight saving) on Monday January 4. Click to embiggen. The Full Moon is Friday January 1. On the Morning of January 1st there will be a partial eclipse of the Moon, visible from Western Australia only. Mid eclipse is 3:22 am (non-daylight saving time), and viewers will see a small section of the moons north pole darken. In the morning, Mars is readily visible in the eastern sky. Red Mars is now the constellation of Leo but is moving back towards Cancer. Mars is a distinct nearly full disk in a small telescope, and becomes bigger and brighter during the week in the lead up to opposition in January. The waning Moon is close to Mars on Monday, January 4. Saturn is visible low in the morning sky between the bright stars Regulus and Spica. Mars, Regulus, Saturn and Spica from a nice line-up with the Moon between January 4 and January 7. Note the location of Vesta, which is visible in binoculars and will become visible to the unaided eye in February. 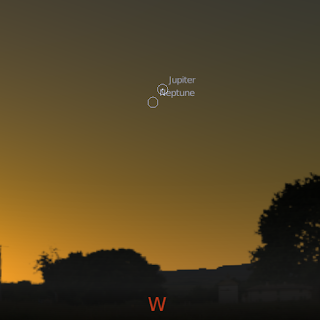 South-Western horizon showing Jupiter at 21:00 pm local daylight saving time (20:00 pm non-daylight saving) on Thursday December 31, click to embiggen. Mercury is lost in the eastern twilight. Jupiter is easily seen as the brightest object in the western evening sky. Jupiter is big enough to be appreciated in even the smallest telescope but its proximity too the horizon makes seeing surface features difficult. Jupiter's Moons are readily visible in binoculars or a small telescope. 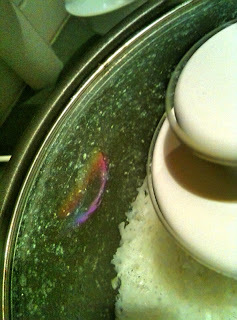 Rainbow formed by refraction through glass doors, seen while Christmas shopping. 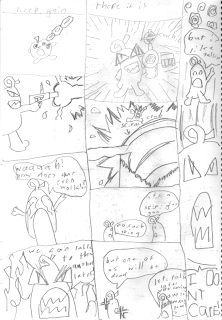 This is MiddleOnes Web comic, it's the story of a spleen. Seen here every Sunday. It should be read right to left Manga style, except when it's left to right (like this starting page) or out of sequence. The right side bar is usually the last panel (anyone who has read "Fruits Basket" will recognise the style). Carnival of Space #134 is here. Carnival of Space #134 is here. Pop on over for a great pre-Christmas read. Morning sky looking north-east showing Mars, Saturn, Regulus and Spica at 3:00 am local daylight saving time (2:00 am non-daylight saving) on Saturday December 25. Click to embiggen. The First Quarter Moon is Friday December 25. On the Morning of January 1st there will be a partial eclipse of the Moon, visible from Western Australia only. Mid eclipse is 3:22 am (non-daylight saving time), and viewers will see a small section of the moons north pole darken. In the morning, Mars is readily visible in the eastern sky. Red Mars is now the constellation of Leo. Mars is a distinct gibbous disk in a small telescope, and becomes bigger and brighter during the week in the lead up to opposition in January. Saturn is visible low in the morning sky between the bright stars Regulus and Spica. Mars, Regulus, Saturn and Spica form a nice line-up. Note the location of Vesta, which is visible in binoculars and will become visible to the unaided eye in February. 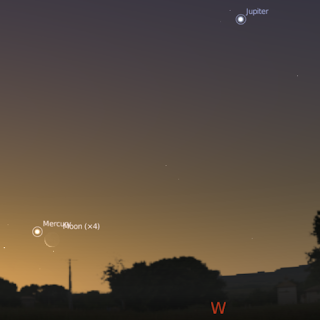 South-Western horizon showing Mercury, the Moon and Jupiter at 21:00 pm local daylight saving time (20:00 pm non-daylight saving) on Friday December 18, click to embiggen. Mercury can be seen just above the south-western horizon between half an hour to an hour after sunset. It will be slowly lost in the twilight as the week progresses. Jupiter is easily seen as the brightest object in the western evening sky. Jupiter is big enough to be appreciated in even the smallest telescope but its proximity to the horizon will make telescope viewing difficult except for Jupiter's Moons which are readily visible in binoculars or a small telescope. If you have an unexpected rainbow you wish to share, send it in. Mind you, I'm a rubbish correspondent, as poor Tony Travaglia knows. S0 if I don't reply from anywhere to a week or a month, it's not because I don't like you, it's because I've been distracted/your mail has disappeared in the hundreds of Australian Science Communicators emails/the dog ate my homework. I will reply! eventually, before the heat death of the Universe. Rush over to the Astronomy Post of the Day for a magnificent image of the Geminids taken from Australia. As an amateur astronomer, I deal with lenses a lot. Most astronomical lenses are complex, multi component things designed to reduce aberration (except gravitational lenses). The simplest lens is the convex lens, where the middle is thicker than the edges. While modern astronomical lenses are made of thinks like crown glass, almost anything can become a convex lens provided it is transparent and can be curved. Like this wineglass. The image is inverted because we are behind the focal point. Anyone else got any inages of "accidental lenses"
Next time you are up in the morning looking at Saturn and Mars, let your eye wander over and down to Spica, the brightest star in the constellation Virgo. About halfway between that and the brightish star Gamma Hydri, is a dim, unprepossessing star; 61 Virginis (helpfully highlighted in the diagram opposite). A mere 28 lightyears away, 61 Virginis is a Sun-like star that harbours at least three planets, discovered in a joint venture between the Keck Observatory and the Anglo-Australian Telescope (yes, Aussies had a hand in this) using radial velocity measurements . Measurement of minute Doppler shifts in the stars spectrum lead to the conclusion that the system has two Neptune like worlds, and one Super-Earth of 5 Earth masses, 61 Virb. The other reported 5x Earth Mass planet Gliese 581c, orbits a Red Dwarf star. Although the star is Sun-like, and the planet is Earth-like (if a 5x Earth mass is sufficiently "Earth" like), the orbit is not. 61 Virb screams around its sun in 4.2 days, in an orbit well inside that of Mercury (not as close as WASP 18b though). The two Neptune mass planets 61 VirC and 61 VirD are also inside the orbits of Mercury and Venus, respectively, on elongated orbits. 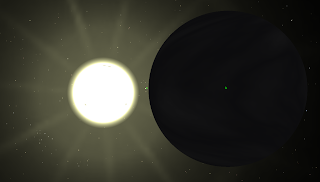 So this is a very "unsolar" solar system, unlike GJ 758b, which is a Jupiter-like planet in a solar system-like orbit around a Sun-like star. 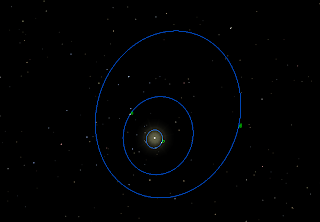 The orbits of 61-Virginis b, c and d. B and c orbit closer than Mercury does to our sun (this and above image generated with Celestia). You can read the original press release here. You can read the paper that will be published soon in The Astrophysical Journal here. If you want to add the 61 Virginis system to Celestia, cut and paste the parameters below to a file and save it as 61Virb.ssc in the extras folder of Celestia. AltSurface "limit of knowledge" "HD 115617/b"
AltSurface "limit of knowledge" "HD 115617/c"
Carnival of Space #133 is now up at The Next Big Future. There's deep space mosaics, SpaceShip One, life on Mars, the Norway Spiral, Solar Sails, Terraforming and much, much more. Scoot on over and have a look. The First Quarter Moon is Friday December 25. Jupiter is easily seen as the brightest object in the western evening sky. Mercury is low in the twilight evening sky. 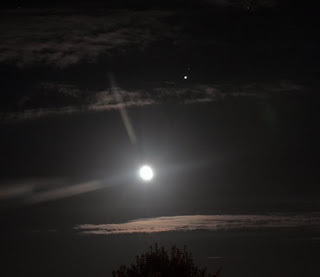 Jupiter and Mercury are visited by the Moon this week. 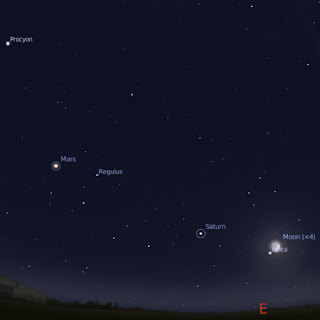 In the morning, Mars and Saturn are easily seen above the north-eastern horizon near the bight stars Regulus and Spica. Algol dims. 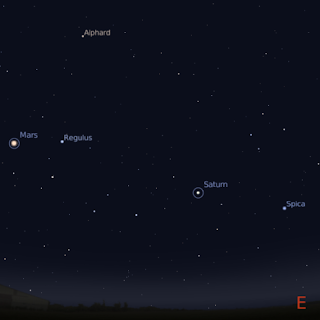 Morning sky looking north-east showing Mars, Saturn, Regulus and Spica at 4:00 am local daylight saving time (3:00 am non-daylight saving) on Saturday December 12. Click to embiggen. The First Quarter Moon is Friday December 25. Saturn is visible low in the morning sky between the bright stars Regulus and Spica. Mars, Regulus, Saturn and Spica from a nice lineup. Mercury can be seen above the south-western horizon between half an hour to an hour after sunset. 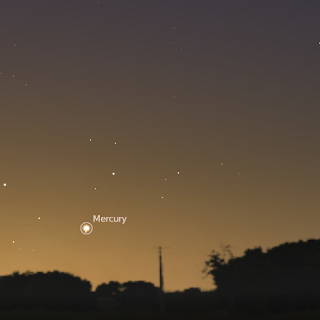 Mercury is close to the thin crescent Moon on Friday 18 December. Jupiter is easily seen as the brightest object in the western evening sky. Jupiter is big enough to be appreciated in even the smallest telescope. If you don't have a telescope to view Jupiter, why not go to one of your local Astronomical Societies or Planetariums open nights? Jupiter's Moons are readily visible in binoculars or a small telescope. Jupiter is close to the waxing Moon on Monday 21 December. Earth is at Solstice, where the day is longest, on December 22. 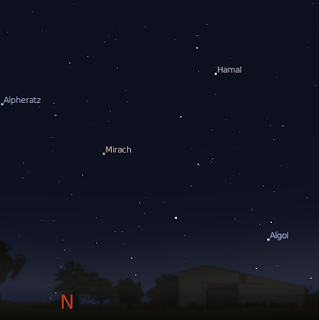 The Northern horizon at 9:00 pm AEDST on December 18 showing the location of Algol. Algol is classic variable star, but is usually hard to see from the southern hemisphere. This week we have a chance to see Algol dim and brighten under reasonable circumstances. On December 18th 10:28 pm Algol will be at its dimmest, over the next few hours you can watch it brighten. The first voting meeting of the reformed Adelaide branch of the Australian Science Communicators was held yesterday night. Once again we were in the Royal Institute Australia's newly refurbished home in the old Exchange Building, Rob Morrison performed a "Two Cultures" bridging poem on Charles Darwin's illness (he pointed out that while it's the 150th anniversary of the "Origin of Species", it's also the 50th anniversary of the "Two Cultures"). In more Two Cultures bridging, George Poonkhin Khut gave people a walk-through of his interactive Heart Library Project. Oh, and we also had some elections for office bearers. I got elected as a councillor. So we've worked out the best time to meet (every third Monday, I have to give up chess club once a month), and the program and events director are feverishly working to choose from the exciting list of events people have thought up to present our 2010 line-up. Sadly, my suggestion of an Andrew Bolt - Barry Brook cage match will probably not get up. Watch this space for more information. And don't forget Dr. Karl is on at the RiAus this Wednesday night. Every meteor shower has its own character. Outside of storm years, with the Leonids you are waiting, waiting, waiting for for a meteor and when you have finally decided to go to bed WHOOSH an amazing fireball would zoom over your head and you would wait ages to see another one like that. The Geminids are more sedate, there is a more or less steady stream of bright but not spectacular meteors with relatively short burns. Very few have you whipping your head around to follow them. In fact until quite late the brightest meteor I saw was a sporadic, but a nice -3 Geminid came in and beat it. The sky was as dark as it gets from my backyard, with a limiting magnitude of 5.5, the night was cool but still. Mars glowered above the horizon and the Pleaides glowed like fireflies in a net. A very pleasant backdrop for watching meteors. Observing note, when picking up your notepade and pencil (to record your observations) from the darkened office by touch, make sure that your children's coloured pencils are far away, otherwise you will do all your note taking in hard to see/read pale green. Overall in an hour, before sheer exhaustion drove me inside, I saw 16 Geminids - around one every 5 minutes. Slightly less than I was expecting but not shabby for a suburban site (and better than predicted by the flux estimator), I was never kept waiting impatiently for a meteor. I also saw 4 sporadic meteors. Most of the meteors were magnitude 1 or less, with short trains. It was a bit like watching fireflies. At the moment, the reported rates for the Geminids is coming in at about half the predicted level, although the reports haven't covered the peak. Some people have been reporting pretty good rates though. Spaceweather has a Geminid meteor Gallery which looks pretty nice. Some nice photos from Roger Groom in WA here, and an IceinSpace thread here. What did you see? The rates for the Geminid meteors are predicted to increase over the next few years, so keep an eye on them. 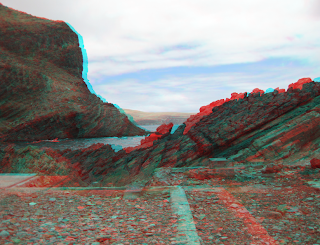 Red-Green anaglyph of the beach near Second Valley Jetty. Click to embiggen, you will need red-cyan 3D glasses to see the 3D effect (doesn't work so well on the thumbnail. We spent the weekend down at Second Valley, a lovely costal town with a really nice beach. I thought being at such a darksy site, I would see how many Geminids I could pick up pre-peak on the Sunday night. Things did not start auspiciously when I discovered I had left my bag with the binoculars, SLR camera, film and lenses for the telescope back in Adelaide. Also the sky was wall to wall cloud from Friday night to Saturday afternoon. However, as evening fell the clouds cleared and the soutern stars came out in all their glory, uninhibited by city lights. So of course when I got up at 2 am to look for meteors, the clouds came back again. The guy he was inside didn't like him "not one bit, all he does is spleen around!" So the Man made a plan "I'm making a plan"
And he carried it out "spleen, can you get me some tea?" "Sure!" The spleen got out ... and was locked out "Cachick"
Cool is a relative thing, in this case the "cool" planet is actually between 280-370 degrees Celsius, not a place for the summer holidays. But most of the exoplanets we've found scream around close to their suns, and have temperatures of between 500-800 degrees Celsius. 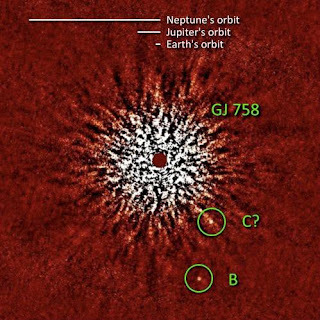 At around 29 AU from its sun GJ 758, a near identical twin to our own, the exoplanet is roughly where Neptune orbits. However Jupiter, which produces more heat than it receives from the Sun, is nowhere near this hot. However, the mass of GJ 758B is between 10-40 times that of Jupiter. This is too low for nuclear fusion, but a range of gravitational and non-gravitational effects mean that these large exoplanets are intrinsically hot. At the large end of the mass estimate, the planet would actually be a failed star, a brown dwarf. 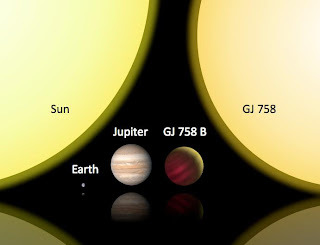 Despite being more massive, the diameter of GJ 758B is similar to that of Jupiter. This planet was the first detected by the planet hunting telescope Subaru, using interfereometry to cancel out the light of the primary star. 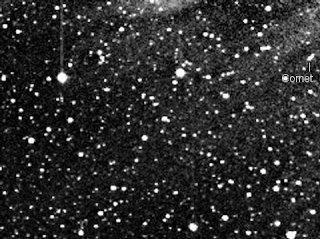 It is the fourth star that has been detected optically (see here and here for infomation on the other 3). GJ 785B moves fast enough that we can follow its orbital dynamics, and is in an orbit similar to the gas giants of our solar system around a sun-like star (previously imaged planets are around non-sun-like stars or have non-solar system like orbits). It's also well positioned so that we can analyse its atmosphere. It's location also will also us to test theories of how massive planets form (core accretion vs direct gravitational collapse). Very likely Subaru will come up with more exciting exoplanets in the months ahead. The northern horizon at 2:00 am AEDST as seen from Southern Australia (northern Australia is similar but Gemini and the radiant is higher in the sky) on Monday December 14. The Geminid radiant is marked with a cross. The Geminids are a fairly reliable meteor shower and this year moonlight will not interfere. Unlike the Leonids, where there is a very narrow peak of high activity, the Geminids have a broad peak and will show good activity well before and after the peak, and on the day before and after. The radiant doesn't rise until just before midnight (daylight saving time) in most of Australia, so you will still have to disturb your sleep for this one. Australians should see a meteor every two to three minutes under dark skies in the early morning of the 14th, between 1:00 am and 4:00 am local time. You can find predictions for your local site at the meteor flux estimator (choose 4 Geminids and date 13-14 December, don't forget to change the date to 2009). However, a recent NASA article suggests that the Geminids may be stronger this year, with possibly a meteor a minute or more at dark sky sites. The International Meteor Organisations Live Geminid report will be useful to follow the shower. At 1.00 am in the morning AEDST (midnight, AEST) Castor (alpha Geminorum) is about two handspans above the horizon and 10 handspans to the left of due north. Pollux, the other twin, is less than a handspan to the left again. The radiant is just below Castor. When you get up, allow at least 5 minutes for your eyes to adjust and become dark adapted (even if you have stumbled out of bed in the dark, here's some hints on dark adaption of your eyes so you can see meteors better) and be patient, it may be several minutes before you are rewarded with you first meteor, then a couple will come along in quick succession (a meteor every two minutes is an average, they won't turn up like a ticking clock but more or less randomly). Choose a viewing spot where you can see a large swathe of sky without trees or buildings getting in the way, or with streetlights getting in your eyes. The darker the spot the better (but do be sensible, don't choose a spot in an unsalubrious park for example). While the radiant is where the meteors appear to originate from, most of the meteors will be seen away from the radiant, so don't fixate non the radiant, but keep your eye on a broad swath of sky roughly centred just above the radiant (as the radiant doesn't rise very high, looking exactly at the radiant will mean you miss some higher up). As well, Orion and the Hyades will be visible and bright Mars will be nearby. So it will be a quite nice morning for sky watching. Keep an eye out for satellites! Image Credit, Jan Petter Jorgensen. 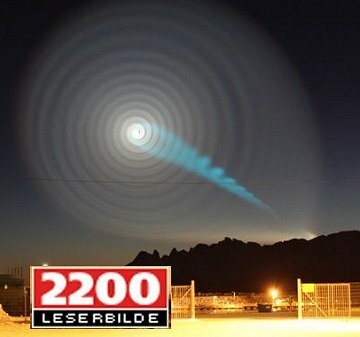 Mysterious spirals in the sky over Norway even got onto the Australian evening news. Evidence is firming that this is a result of a rocket malfunction that occurred high in the upper atmosphere. The basic idea is that material jetting out from a spiralling missile would form stable spirals in the upper atmosphere. Phil Plait discusses this at Bad Astronomy and has a video of a simulation that generates the spiral seen. See Spaceweather for lots of links to images and videos, particularly this image which appears to show the glowing spiral cone originating in the end of a booster trail. That slightly elongated blob is a comet discovered by Jiangao Ruan. Will it survive it's passage of the Sun? Here's an animation I made of it zipping along. The comet appears towards the middle of the right hand side. The two bright stars are delta and gamma Capricornii. Carnival of Space #132 is here. Carnival of Space #132 is now up at Steve's Astro Corner.There's last drinks at the Outpost Tavern, space elevators, astronomical advent calendars, life on Mars, purchasing telescopes and much, much more. Go on over and have a look. Astrology - the face off. Interesting segment from our very own Channel 7 where an Astrologer and a sceptic face off. A bit bit of a hash but worth viewing for a chuckle. Tip of the Hat to Greg Laden. EldestOne had his cast removed, the doctors are pleased with his legs progress, and he now wears a technicolour splint. The chess club EldestOne started at school with his friend The Medic (I am NOT a spy) proved popular and will continue next year. The Bettdeckererscnappender weisle has been offered a decent job. While our NH&MRC grant didn't get up (sob), we got an ARC linkage grant (Yay!). Unfortunately, as I am 4328th investigator on the multi-investigator grant my share of the money is around 50 cents a year. Green Tea guy, who did honours with me this year, got a First Class Honours (as did the two chemistry Honours students who worked in my Lab) and is likely to get a scholarship. And finally, my friend John has got a well deserved associate professorship at Bond University, I'll be able to see him again on my regular pilgrimages to my family. The New Moon is Wednesday December 16. Jupiter is is easily seen as the brightest object in the western evening sky. Mercury is low in the twilight evening sky. In the morning, Mars is easily seen above the north-eastern horizon. Saturn is close to the dawn horizon. The crescent Moon form a line with Mars and Saturn. The Gemind meteor shower returns. Morning sky looking north-east showing Mars, Saturn and the Moon at 4:00 am local daylight saving time (3:00 am non-daylight saving) on Saturday December 12. Click to embiggen. The New Moon is Wednesday December 16. Saturn is visible low in the morning sky between the bright stars Regulus and Spica. On Saturday December 12 the crescent Moon is close to Spica, forming a nice line with Saturn, Regulus and Mars. 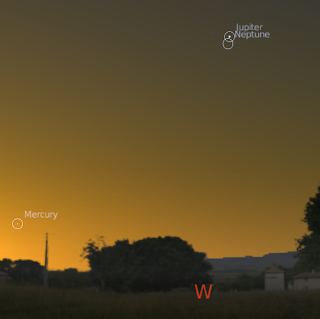 South-Western horizon showing Mercury at 21:00 pm local daylight saving time (20:00 pm non-daylight saving) on Monday December 14, click to embiggen. Mercury can be seen above the south-western horizon between half an hour to an hour after sunset. Mercury is close to the bright star Nunki in the handle of the "teapot" of Sagittarius on the 14th and 15th. Jupiter is easily seen as the brightest object in the western evening sky. Jupiter is big enough to be appreciated in even the smallest telescope. If you don't have a telescope to view Jupiter, why not go to one of your local Astronomical Societies or Planetariums open nights? Jupiter's Moons are readily visible in binoculars or a small telescope. The radiant doesn't rise until just before midnight (daylight saving time) in most of Australia, so you will still have to disturb your sleep for this one. Australians should see a meteor every two to three minutes under dark skies in the early morning of the 14th, between 1:00 am and 4:00 am local time. You can find predictions for your local site at the meteor flux estimator (choose 4 Geminids and date 13-14 December, don't forget to change the date to 2009). At 1.00 am in the morning AEDST (midnight, AEST) Castor (alpha Geminorum) is about two handspans above the horizon and 10 handspans to the left of due north. Pollux, the other twin, is less than a handspan to the left again. 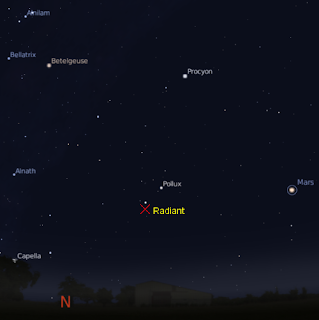 The radiant is just below Pollux. "At this time of year the morning sun shines through the edge of our glass balustrade on the upstairs balcony and, courtesy of the massive A-Frame skylight through which I can view the moon and stars, shines on our Ikea poster of Amsterdam ..."
Dang that's good! Thanks Alan for sharing this unexpected rainbow. Click to embiggen. ... and the radio waves carried a voice from afar. I just came back from the annual meeting of the Australian Society of Clinical and Experimental Pharmacology. While I was there I ran into one of my colleagues who has been working for 2 years in Fiji. Imagine my surprise when she said that she had hear a familiar voice on Radio Australia one day, and it was me talking about astronomy! My radio efforts do carry far and wide. Over the years I have developed a vision for this blog, every week at least one "look up it's purty" post, one substantial post on soemthing of note, acouple of nice astrophotos and on Sundays a wildlife photo of the gad-zillions lurking on my hard drive or a guide to a neat family friendly bushwalk. I've managed the "look up" posts okay, but Sundays have been a bit of a flop. 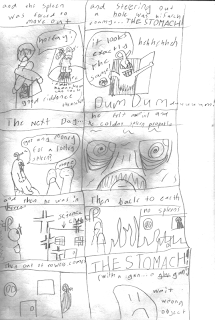 So starting next Sunday, I'll be posting weekly instalments of MiddleOnes webcomic, Spleen Guy. Tony Travaglia of Otago, New Zealand, has produced some wonderful atmospheric shots of the Moon and Jupiter. He sent them to me two months ago, so I have been very remiss in not putting them up till now. My apologies Tony, everyone, enjoy! (oh yes, and click to embiggen). Adelaide airport, light shining through the glass partitions formed this intense linear "rainbow". Carnival of Space #131 is here. 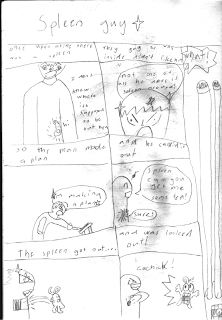 Carnival of Space #131 is now up at Starry Critters. There aurora at Saturn, geysers at Enceladus, SIRIT in the sand trap, videos of fireballs and lots lots more. Pop over and have a look. The Last Quarter Moon is Wednesday December 9. Jupiter is is easily seen as the brightest object in the evening sky. Mercury is low in the twilight evening sky. In the morning, Mars is easily seen above the north-eastern horizon. Saturn is close to the dawn horizon. Mars and Saturn are visited by the waning Moon. Morning sky looking north-east showing Mars and Saturn at 4:00 am local daylight saving time (3:00 am non-daylight saving) on Thursday December 10. Click to embiggen. The Last Quarter Moon is Wednesday December 9. In the morning, Mars is readily visible in the eastern sky. Red Mars is now the constellation of Leo. Mars is a distinct gibbous disk in a small telescope, and becomes bigger and brighter during the week in the lead up to opposition in January. On Monday December 7 the Moon is close to Mars, then on Tuesday December 8 the Moon is close to the bright star Regulus. 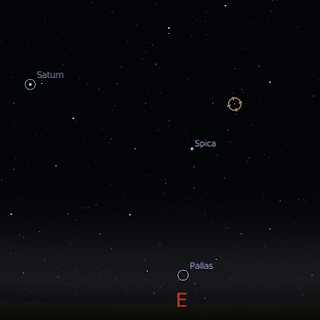 Saturn is visible low in the morning sky between the bright stars Regulus and Spica. On Thursday December 10 the crescent Moon is close to Saturn. 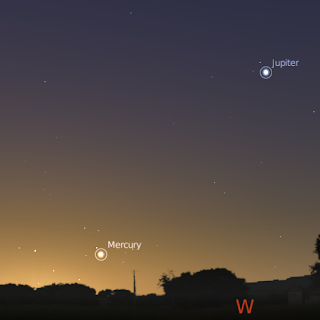 South-Western horizon showing Mercury at 21:00 pm local daylight saving time (19:40 pm non-daylight saving) on Thursday December 10, click to embiggen. Mercury can be seen above the south-western horizon between half an hour to an hour after sunset. This week it moves in to the "Teapot" of Sagittarius, on on Thursday December 10 it is very close to the star Lambda Sagittarii, the "lid" of the teapot.